World’s Lamest Blogger coming to you, over a month after her last post. I wonder how long the interweb will hold on to a space before they deem it wasteful and drop kick it into the outlying galaxies?? It’s probably gonna happen to me. Here’s what I’ve got going on today. Later, there is a Soup Swap. I’ve made my six quarts of pumpkin soup and I’m ready to pick out the soups I want to bring home. I’ve been on soup overload for the past several weeks. I’ve made pumpkin, vegetable, pea, potato and yesterday I made an Italian Chicken Soup. I tend to like creamy soups and tomato based soups. I’m not a big fan of chicken-y noodle-y rice-y soups. I don’t care for pasta in my soup but my husband does so I’m hoping to bring him home a quart of pasta fagioli. And finally tonight, the youth from church are scheduled to be here. This happens twice a month. They are awesome. They really are. Those kids love getting together and they really care a lot about each other. They bring food, they sing, have a lesson and hang out. They will hang out until I tell them they have to go. And then some of those that drive still hang around outside for the longest time. They really are a privilege to work with and to be around. But have I been reading??? A little bit. I haven’t been super productive with the reading but I haven’t exactly stopped. Since I’ve last reported, which I think was in August, I have read Breakfast at Tiffany’s for book club, Mockingjay, and I loved it, not in a happy way but in a “well done” way. The Monkey Era, a small collection of journal type entries on Kindle. It was super short. Process, The Writing Lives of Great Authors, I really enjoyed that one. Tom Sawyer and Diary of a Wimpy Kid. Hmm…it’s more books than I thought. I am currently reading The Last Anniversary by Liane Moriarty and Sophie’s Choice by William Styron. I thought I was going to start on Huck Finn but the Sophie’s Choice drew me. I have a feeling it is going to hold me captive. It’s already so deep and wordy and literary. Mike and I are STILL reading The Rosie Project aloud to each other. You remember, we started that one on Mother’s Day. We should finish it soon. Then finally, I’ll be getting to 101 Dalmations (the original) by Dodie Smith for book club. I am currently in the final season of Gilmore Girls. There will most definitely be a post about that coming up. I hope I’m not mad at any of the characters when season 7 ends. I have experienced a few moments of disappointment when things haven’t gone my way. I am happy to see that there will be a four part revival coming up on Netflix. Oh! And finally, I just had my 25th college reunion. I met up with my girlfriends on Friday for dinner and we had a sleepover just off campus. A lovely lady that Cynthia was close to in college lives in the area and for the second time she has offered us her home to stay in for Homecoming, while she was away. We stayed there, talked and caught up forever, and the next day attended an Alumni luncheon where we got cool, free stuff and had our individual photos made with the new President of the University. (I know, that is goofy but these are some of the perks to going to a small, private, expensive school.) Yes, my parents paid three arms and a leg for me to go but every time I go back I am so proud of the campus and it’s nice to see what all the tuition money went to. Then we were off to the football game. 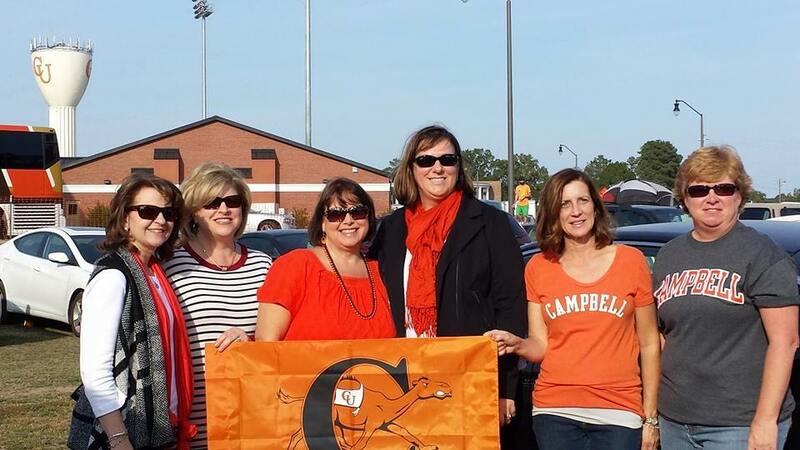 I love these girls, they are life long friends and I am so grateful for my years at Campbell University. Well, that’s it for now. Happy November! Be Thankful! Read! Sleep! Eat soup! ← Four Blog Blitz and a Giveaway!!! Three arms and a leg, a published blogger, and home school teacher, and my lovely, quirky daughter seems to have over looked the spelling of quart,or did you mean court? Ha ha! Apparently I did that twice because I caught myself the second time. Thanks, Momma. Glad you’re back from the Galaxies. You just blog in spurts, that’s all. Sophie’s Choice eh? Pretty dark stuff for fall. That’s an oldie but a goodie. Nice pic of the college reunion; so fun seeing old friends. My 25th reunion passed a few years back. Gulp. I went to the 20th but not the 25th.